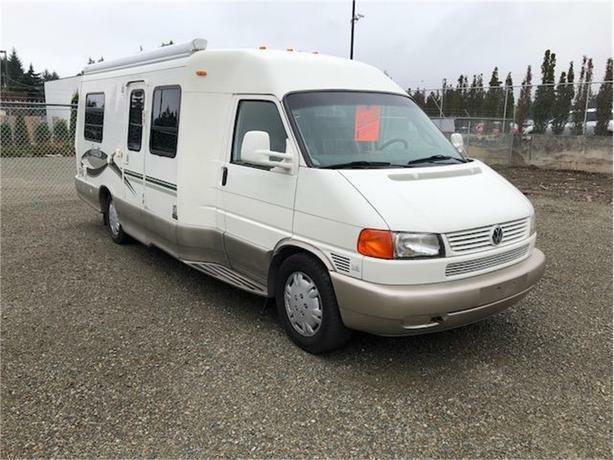 2002 VW Eurovan Rialta 22QD Motorhome - This unique VW Rialta 22QD (Winnebago) has 122,379kms. It is powered by a VW 2.8-litre inline six cylinder engine with 201 horsepower and a 4-speed electronically controlled automatic transmission. It is front-wheel-drive. The Rialta comes with laminate counter-tops, two burner gas stove, fridge, sink, dinette, and microwave. It also has a dual-control lavatory faucet/expandable cabinet. The Rialta has a 4-gallon water heater, and is equipped with air conditioning.The Rialta is nimble and very maneuverable compared to other motorhomes.